Aston Villa football club, headquartered in Aston, Birmingham, is also known as The Villans, The Villa and simply Villa. They are part of the English Premier League and have a very long history. Founded in 1874, Aston Villa was originally created by people who belonged to the Villa Cross Wesleyan Chapel. This chapel was located in Handsworth. In the beginning, there were four founding members who were Frederick Matthews, Walter Price, William Scattergood and Jack Hughes. 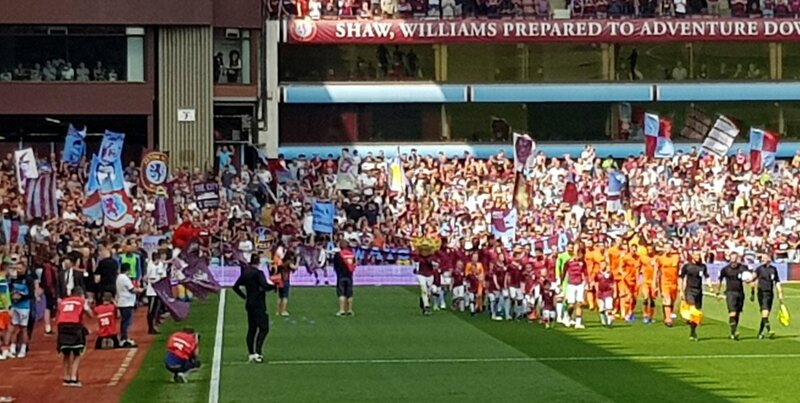 It didn't take long for Villa to become one of the premier and most talented clubs in the Midlands. Incredibly, they won their first football honour in 1880, with the Birmingham Senior Cup. This shows what a long and proud tradition the Aston Villa has. Aston Villa didn't stop there though. In 1887 they played phenomenally and were able to win their very first FA Cup. The captain of the team at that time was Archie Hunter, and Hunter quickly became a famous player and was well known all over the area by the huge number of football fans. All told, The Villa would become the most prominent and successful club of the Victorian period. They won many cups and trophies during this time, and they moved into what is still their home today, at Aston Lower Grounds (which is more commonly referred to as Villa Park, especially by fans). Villa proceeded to win many more cups and honours; however, in 1936 they were put down to the Second Division for the first time in the history of the club. Most people placed the blame for this squarely on the team's struggling and imperfect defensive record. Then the Second World War interrupted play for all English clubs for an incredible seven seasons. Many promising players' careers also came to ends during this unfortunate conflict. Although there was more struggling in ensuing years, Aston Villa began a comeback of sorts and in 1961, they won the League Cup in its first year. This was followed by a period of dismal performance and problems, culminating in the relegation again of Villa to the Third Division in the 1969-1970 season. Aston Villa finally made it back to the First Division in 1977, much to the pleasure of their fans and players. Villa had many spectacular victories in the coming years, including The European Cup in the 1981-1982 season, an incredible accomplishment. Villa also was one of the founding members of the Premier League in 1992. They began in the league challenging Manchester United for the title, but had struggles afterward. 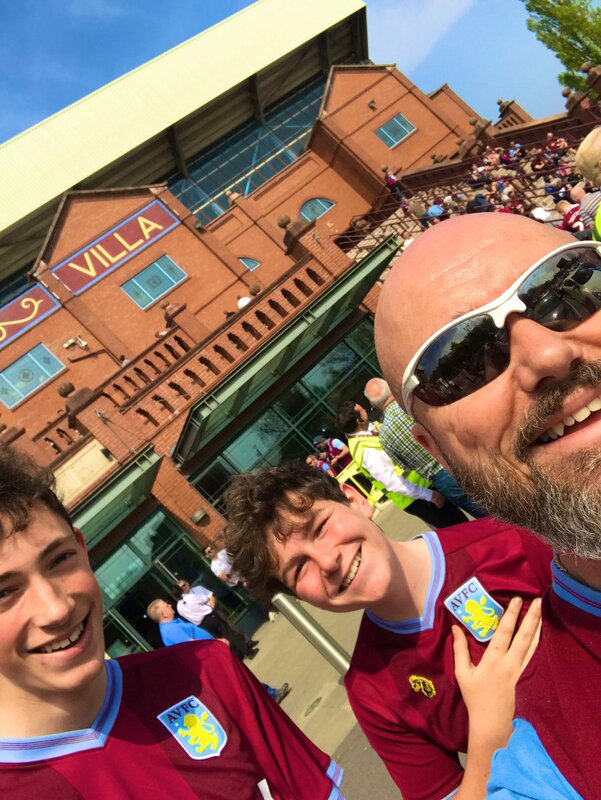 Despite the many ups and downs, though, The Villa remains one of the most popular football clubs in England and its long record and history speaks for itself. Aston Villa are still arguably the most popular club in the Midlands, a fact only the strongest Birmingham City fan would argue with! On top of that they have threated the top of the Premier League table several times so it's quite surprising that they don't get more TV coverage. It's no wonder then that so many Aston Villa fans go looking for Aston Villa live information online. 90'+4' - Thats all. Game finished - Aston Villa 1, Millwall 0. 90'+4' - Second Half ended - Aston Villa 1, Millwall 0. 90'+3' - Shot blocked. Conor Hourihane - Aston Villa - shot with left foot from outside the box is blocked. 90'+3' - Aiden O'Brien - Millwall - receive yellow card for a foul. 90'+2' - Jack Grealish - Aston Villa - won a free kick in attack. 90'+1' - Corner - Aston Villa. Conceded by Aiden O'Brien. 90'+1' - Jack Grealish - Aston Villa - won a free kick on the right wing. 90' - Corner - Aston Villa. Conceded by Jake Cooper. 90' - Shot blocked. Andre Green - Aston Villa - shot with right foot from the right side of the box is blocked. Assist - John McGinn. 89' - Substitution - Millwall. Tom Elliott for Mahlon Romeo. 88' - Corner - Aston Villa. Conceded by David Martin. 88' - New attacking attempt. Anwar El Ghazi - Aston Villa - shot with right foot from the left side of the box is saved in the right corner. Assist - John McGinn. 87' - Ryan Leonard - Millwall - won a free kick in defence. 86' - Missed chance. Lee Gregory - Millwall - shot with right foot from few metres goes high. Assist - Alex Pearce with a head after corner. 86' - Corner - Millwall. Conceded by Tyrone Mings. 85' - Keinan Davis - Aston Villa - receive yellow card for hand ball. 84' - Corner - Aston Villa. Conceded by Ryan Leonard. 84' - Corner - Aston Villa. Conceded by David Martin. 84' - New attacking attempt. Andre Green - Aston Villa - shot with left foot from the centre of the box is saved in the top centre of the goal. 84' - Shot blocked. Anwar El Ghazi - Aston Villa - shot with right foot from outside the box is blocked. Assist - John McGinn. 81' - Neil Taylor - Aston Villa - receive yellow card for a foul. 80' - David Martin - Millwall - won a free kick in defence. 80' - Offside - Millwall. David Martin with a pass, however Lee Gregory is in offside. 79' - Substitution - Millwall. Steve Morison for Ryan Tunnicliffe. 79' - Mahlon Romeo - Millwall - won a free kick in defence. 79' - New attacking attempt. Anwar El Ghazi - Aston Villa - shot with right foot from the left side of the box is saved by goalkeeper in the centre of the goal. Assist - Conor Hourihane. 76' - Substitution - Aston Villa. Keinan Davis for Jonathan Kodjia. 75' - Shane Ferguson - Millwall - won a free kick on the left wing. 74' - Shot blocked. Ben Marshall - Millwall - shot with the head from the centre of the box is blocked. Assist - Jed Wallace with a cross. 72' - Corner - Aston Villa. Conceded by Alex Pearce. 72' - Shot blocked. Jack Grealish - Aston Villa - shot with right foot from the centre of the box is blocked. Assist - John McGinn. 71' - Missed chance. Jake Cooper - Millwall - shot with the head from the centre of the box missed. Assist - Alex Pearce . 68' - Delay in match Ben Marshall - Millwall - - injury. 68' - New attacking attempt. Jack Grealish - Aston Villa - shot with right foot from the centre of the box is saved by goalkeeper in the centre of the goal. 67' - Mile Jedinak - Aston Villa - won a free kick in defence. 66' - Missed chance. Andre Green - Aston Villa - shot with right foot from the right side of the box is close, but missed. Assist - Jack Grealish. 64' - Substitution - Millwall. Aiden O'Brien for James Meredith. 63' - Corner - Aston Villa. Conceded by Mahlon Romeo. 63' - Shot blocked. Anwar El Ghazi - Aston Villa - shot with left foot from the left side of the box is blocked. Assist - Jack Grealish. 60' - Substitution - Aston Villa. Andre Green for Albert Adomah. 60' - Substitution - Aston Villa. Conor Hourihane for Glenn Whelan. 59' - James Meredith - Millwall - won a free kick on the left wing. 56' - Alex Pearce - Millwall - won a free kick in defence. 56' - Missed chance. Jonathan Kodjia - Aston Villa - shot with right foot from the right side of the box missed to the left. Assist - Albert Adomah. 55' - Missed chance. Mahlon Romeo - Millwall - shot with right foot from outside the box missed to the left. Assist - Ben Marshall. 54' - Lee Gregory - Millwall - won a free kick in defence. 52' - Missed chance. Jed Wallace - Millwall - shot with right foot from outside the box goes high following a fast break. 48' - Shane Ferguson - Millwall - won a free kick on the left wing. 47' - John McGinn - Aston Villa - won a free kick in defence. 46' - New attacking attempt. Anwar El Ghazi - Aston Villa - shot with right foot from outside the box is saved by goalkeeper in the centre of the goal. Assist - Jack Grealish. 45' - Second Half starts Aston Villa 1, Millwall 0. 45'+2' - First Half ended - Aston Villa 1, Millwall 0. 45'+1' - Lee Gregory - Millwall - won a free kick in defence. 45' - Jed Wallace - Millwall - won a free kick in defence. 44' - Shot blocked. Ben Marshall - Millwall - shot with left foot from the right side of the box is blocked. 44' - Shot blocked. Ben Marshall - Millwall - shot with right foot from the right side of the box is blocked. Assist - Jed Wallace with a cross. 41' - Corner - Aston Villa. Conceded by Jake Cooper. 41' - Shot blocked. John McGinn - Aston Villa - shot with right foot from the right side of the box is blocked. Assist - Glenn Whelan. 39' - Missed chance. Jake Cooper - Millwall - shot with the head from the left side of the box missed to the left. Assist - Ben Marshall . 39' - Ben Marshall - Millwall - won a free kick in attack. 38' - New attacking attempt. Anwar El Ghazi - Aston Villa - shot with right foot from outside the box is saved in the top centre of the goal. 37' - Jack Grealish - Aston Villa - won a free kick in attack. 35' - Shot blocked. Jack Grealish - Aston Villa - shot with right foot from outside the box is blocked. Assist - Glenn Whelan. 33' - Missed chance. Lee Gregory - Millwall - shot with right foot from the centre of the box is close, but missed to the left. Assist - Ben Marshall with a cross . 33' - Shot blocked. Ryan Leonard - Millwall - shot with the head from the centre of the box is blocked. Assist - Ben Marshall with a cross. 32' - James Meredith - Millwall - won a free kick on the left wing. 30' - GOAL!!! 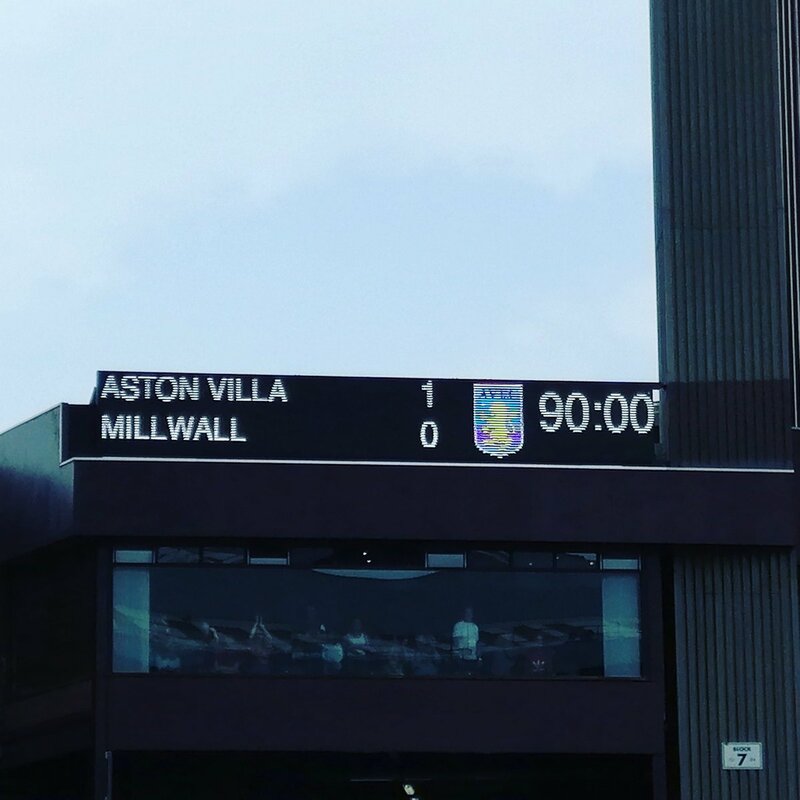 Aston Villa 1, Millwall 0. Jonathan Kodjia - Aston Villa - shot with right foot from few metres to the left corner. Assist - Anwar El Ghazi. 27' - Jake Cooper - Millwall - receive yellow card for a foul. 27' - Jonathan Kodjia - Aston Villa - won a free kick in attack. 26' - Corner - Aston Villa. Conceded by Jake Cooper. 23' - James Meredith - Millwall - won a free kick in attack. 21' - Jack Grealish - Aston Villa - won a free kick on the left wing. 20' - Missed chance. Shane Ferguson - Millwall - shot with left foot from outside the box is high and wide to the right from a free kick. 19' - Lee Gregory - Millwall - won a free kick in attack. 17' - Corner - Aston Villa. Conceded by Ben Marshall. 15' - Corner - Millwall. Conceded by Jed Steer. 15' - New attacking attempt. Jed Wallace - Millwall - shot with left foot from outside the box is saved in the top centre of the goal. Assist - Ben Marshall. 14' - Corner - Millwall. Conceded by Jack Grealish. 13' - Shot blocked. Ben Marshall - Millwall - shot with left foot from outside the box is blocked. Assist - Lee Gregory. 9' - Missed chance. Anwar El Ghazi - Aston Villa - header inside of six yard box - left side is close, but missed to the left after corner. 9' - Corner - Aston Villa. Conceded by Alex Pearce. 8' - Ben Marshall - Millwall - won a free kick in defence. 6' - Missed chance. Mile Jedinak - Aston Villa - shot with right foot from outside the box is close, but misses the top left corner from a free kick. 5' - Jack Grealish - Aston Villa - won a free kick in attack. 4' - Corner - Aston Villa. Conceded by Shane Ferguson.